Mr. Marushack addresses the student body at last week's Pride assembly. Congratulations are due Kristi Elliott, Fremont Regional Health Coordinator, Patricia Sallie, District Nurse, and Paula Buser, Director of Student Support Services. Last week our region was awarded a $450,000 school health professionals grant. This money will allow us to increase the presence of School Health Professionals in all our schools, as well as those in Florence and Cotopaxi, for the next three years. Doing so will support substance abuse and behavioral health needs. We'll also provide training and curriculum resources to those we hire. These positions will be filled by qualified and licensed nurses, counselors, psychologists, or social workers to provide care coordination and connect students at-risk of substance abuse with service providers from community-based organizations for treatment and counseling. Thank you, Kristi, Patricia, and Paula for bringing these helpful resources to our schools! I would also like to offer a shout out to Cañon City High School Math Teacher Kevin Marushack and Athletic Director Scott Manchester for putting their heart and soul into the development of the CCHS Pride Club. An idea conceived by Mr. Manchester several years ago, The Pride builds school spirit, offers avenues for ALL students to form a close connection to their school, engages kids in community service, and offers safe activities for 9th through 12th graders. On Friday, I had the pleasure of observing the back to school Pride Assembly where last year’s shirt and banner were retired, new ones were unveiled, and our Class of 2018 was honored by the rest of the student body. 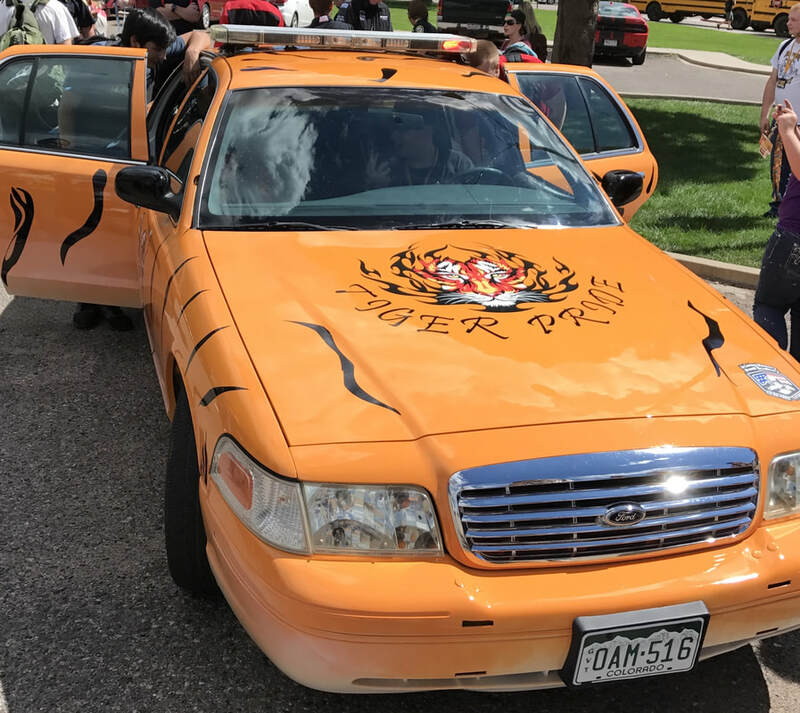 The Tiger Pride car was unveiled at Friday's Pride Assembly! Mr. Morton and Mr. Duston show off their hard work! 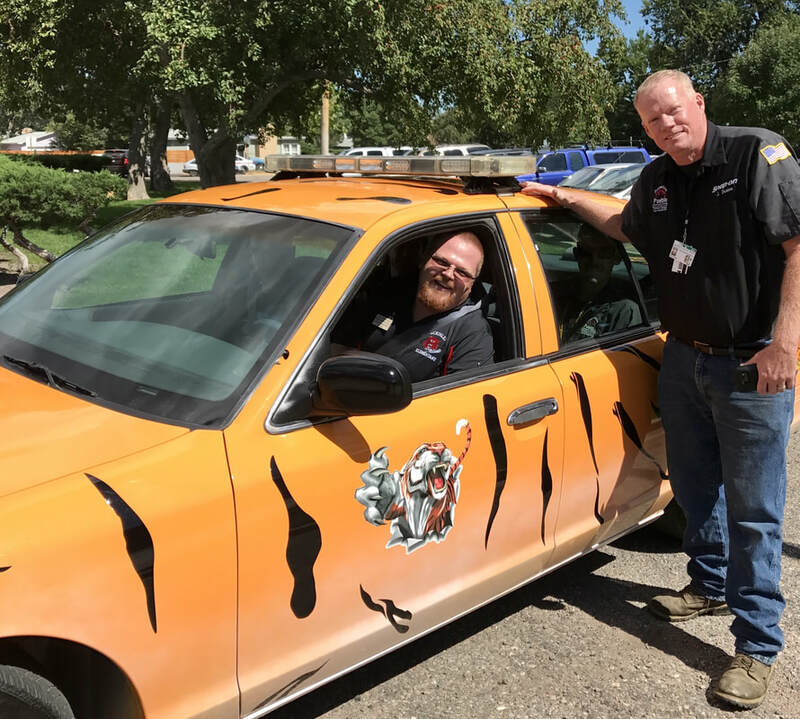 Speaking of Pride, we need to thank the Cañon City Police Department, McKinley Elementary Principal Scott Morton, and Pueblo Community College/Cañon City High School Automotive Trades Instructor John Duston for their vision and work on a project revealed to students last Friday, the Pride Car. Two years ago, when Mr. Morton was a high school administrator, CCPD mentioned they had an old police cruiser they thought our automotive students might like to work on. Mr. Morton went a step better, proposing the car, siren, lights and all, be refurbished to promote school spirit. During the last two years Mr. Duston had his automotive students work on the project, and the result was unveiled at Friday’s Pride assembly. The car glistens, is fully operable, and should be an outstanding addition to outdoor sporting events and parades for many years to come. Water from a leaking pipe damaged network equipment at Washington. The age of the school means no technology closets were built into it. Based on Kindergarten and 1st Grade pupil numbers at Harrison, Washington, and McKinley right now, and because we had to operate on a razor thin staffing budget this year because we received late notice about a $120,000 reduction in federal programs funding, we had to make a decision to transfer staff between buildings after school had already begun. I want to thank principals Scott Morton, Brain Zamarripa, Marne Autobee, and assistant principal Garrett Olguin for their coordination of this difficult work. However, I most want to show my appreciation to the folks who this most directly effects. Wendy Humburg will be moving from a 3rd grade position at McKinley to a 1st grade position at Harrison so we can offer more equitable class loads there. I know this will be a huge task for her to set up a classroom from scratch once again. Amy Williamson had to hand her McKinley 1st graders over to 1st grade teacher Monica Kelly, and will be taking over Wendy’s former students at McKinley. We will also be moving a Kindergarten support position from McKinley to balance out large class loads at Washington Elementary, leaving Cheri Roberts and Chalea Montoya with less help than they are used to. This is certainly not a situation we would like to find ourselves in on an annual basis but between our tight budget and our value for offering school choice, this is the circumstance we were in. Last weekend a water line leak in the basement of Washington Elementary damaged network switches that service a large portion of the building causing phones and portions of the network not to be operable during the first week of school. Director of Technology Shaun Kohl and his crew have created some temporary work arounds, but the cost of the repair will approach $20,000. On Monday evening the board of education will consider placing two questions on this November’s ballot, one in hopes of financing significant building repairs and upgrades, and another to support the annual operations of the district for the next ten years. Should the questions receive board approval I’ll share more detailed information about them in this forum. On Monday and Tuesday, I made the rounds of school openings. During the week, I also meet with some of our literacy coaches, attended the Washington Elementary open house, held a SAC meeting, attended an Early Childhood Leadership Commission meeting in Denver, attended a Cañon City Republican Party meeting to share information about our potential ballot questions, and touched base several times with Director of Instruction Adam Hartman. I also spent time writing bond and mill override question and answer sheets, published a video about our facilities needs at Washington Elementary, and attended the CCHS Pride Assembly. Harrison students attend a back to school assembly. I will tend to some personal matters early this week, but will sit in on a Building Bridges For Quality Cañon City Schools meeting about potential ballot questions Tuesday evening, work in the office setting up evaluation systems for the year, drop in on the McKinley Elementary Open House, stop by Cañon Exploratory School's Culture Night, meet with our literacy team and director of instruction, and touch base with Director of Student Support Services Paula Buser about updating our safety Unified Improvement Plan.